In September 2015, global leaders agreed on the United Nations Sustainable Development Goals, which incorporated an important change from the previously established Millennium Development Goals: reducing inequality. Such change is not surprising, since inequality has been associated with a host of negative outcomes, such as higher crime rates, poorer health, and lower human capital accumulation. The U.N. also established sub-targets to achieve the goal of reducing inequality such as promoting inclusion of minorities, reducing discrimination, adopting fiscally progressive policies, and facilitating labor mobility. However, if we turn our attention to wage inequality—a major determinant of total income inequality—there seems to be an important missing target to achieve equal distribution of income: reducing inequalities across firms. According to our latest research, wage inequality is indeed driven by wage gaps across firms in Europe, which are at the same time driven by differences in the rate of adoption of digital technologies. For example, differences in wages across firms explain more than half of wage inequality in Bulgaria, Estonia, and Latvia, while differences in educational attainment or occupations across workers explain only a third or less (see Figure 1). These findings imply that the wage difference between a custodian working at a high-paying firm and a custodian working at a lower-paying mom and pop store are a greater driver of total wage inequality than the difference between the wages of a custodian and a university graduate within the same firm. The adoption of digital technologies by firms is also a driver of wage disparities, as technological change allows for higher labor productivity and thereby higher wages. In fact, the higher the wage premium associated with working at high-tech firms in a country, then the larger the share of total wage inequality across firms is. 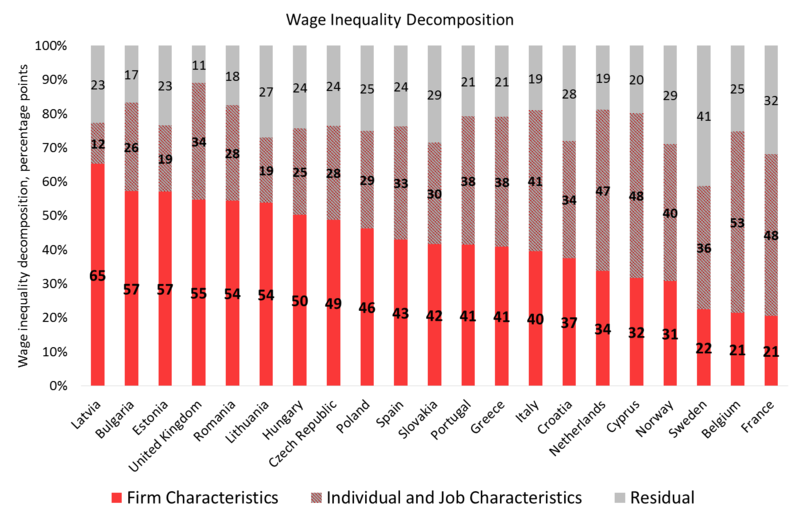 What these results mean is that the “Googles” of Europe pay higher wages to every employee, from custodial staff to engineers, and such wage premiums seem to be more important in explaining total wage inequality than educational attainment or other socio-demographic characteristics (such as gender or experience) of workers. What are the policy implications? The lack of incentives to adopt new technologies is a critical determinant of the dispersion of labor productivity and wages across firms. For example, we find that firms facing more competition are more likely to adopt the internet. At the same time, 1 out of 4 firms in Europe does not use Cloud computing—which could bring huge cost savings—because of cyber-security concerns. Finally, some firms may not have incentives to incorporate technologies such as e-invoicing systems because the system requires other firms to have it as well. According to the Sustainable Development Goals, inequality could be reduced by implementing inclusive and progressive economic policies. In terms of the policy agenda, our findings suggest that policies to increase efficiency and equity can also go hand-in-hand. More specifically, leveling the playing field for firms to incorporate new technologies, to become more productive, and to pay higher wages could bring important equity and efficiency gains.